If you haven’t tried badges before, now’s the time. Badges just got much cooler in iQualify with the new IMS Open Badges 2.0 standard. We’ve been working on making our badges fully compliant with the standard, and you’ll see the results in any new offerings you activate. Thinking about the way you structure your content and assessment to align with a badge framework that you design is a great way to keep learners engaged and motivated. It also means they can share their progress and success through career related sites, like LinkedIn, on social media like Facebook, or through special online badge collection services like Mozilla Backpack. That’s great advertising for you, and great recognition for them. 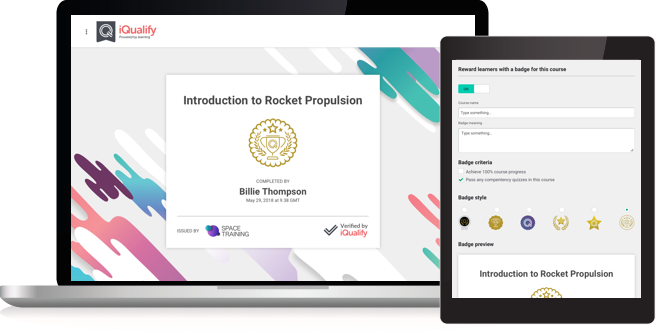 Many of our customers are having success with creating smaller courses that can award a badge around a specific skill or knowledge area. It helps to keep things focussed. With the new standard, you can be sure that the badge is genuine and verified by us. You’ll join thousands of other companies around the world who award achievement in this way. It’s a well adopted and secure form of digital recognition and any third party can check out the validity of the badge, see who issued it, when it was issued, and what the criteria was for being awarded the badge. Badges are designed and issued by you, they carry your logo and name for the life of the badge - your brand is baked in. Then they’re verified by us. If you want some help to get started, look out for future articles in our Knowledgebase on creating an internationally recognised digital badge, or sharing a digital badge through LinkedIn. Alternatively if you’re already one of our customers and new to microcredentialling, get in touch with us at support@iqualify.com and let us help you design a badge framework that works for you.